A group of researchers led by Baolin Zhang, a meteorite specialist at the Beijing Planetarium, study a giant meteorite that was found in a remote, mountainous region in northwest China. This story was updated at 5:36 p.m. EDT. A massive space rock – one that could rank as one of the largest meteorites ever recovered – has been found in a remote and mountainous region in northwest China, according to news reports. 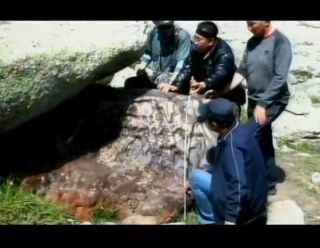 The huge and oddly-shaped rock was found in the Altai mountains in China's Xinjiang Uygur province, according to Sky and Telescope magazine. Earlier this month, Baolin Zhang, a meteorite specialist at the Beijing Planetarium, led a small team up a 9,500-foot (2,900-meter) summit to investigate reports of the supposed meteorite. "This is a huge iron meteorite," Zhang said in footage from China Central Television. "It may be the second largest iron meteorite, which can cause a sensation in China and also attract attention from [the] world's meteorite fields. It comes from outside solar system and it is of great appreciating value and of more scientific value." The large brown stone juts out from beneath a larger granite slab and the portion above ground measures about 7.5 feet (2.3 m) long and half as wide, reported Sky and Telescope. Zhang estimates that the meteorite's mass could range between 25 to 30 tons, which would make it one of the largest meteorites known. If so, this space rock would surpass the current largest one in China, a 28-ton meteorite that was discovered in 1898 in the same region, reported Sky and Telescope. The Xinjiang discovery could represent a very exciting find for the scientific community, if the rock can be confirmed as a meteorite, said Meenakshi Wadhwa, director of the Center for Meteorite Studies at Arizona State University. "If this can indeed be verified as a bona fide iron meteorite, then it would certainly be an important find," Wadhwa told SPACE.com in an email interview. Since most meteorites were formed close to [about] 4.6 billion years ago, when the solar system was formed, any newly discovered meteorites (regardless of their size) have the potential to provide scientists with some unique insights into the formation and earliest history of our solar system." Wadhwa added that the pictures of the Xinjiang rock that have been released so far appear to show good promise of it being an iron meteorite. And while the Xinjiang finding is quite large, the largest known meteorite to date has a mass of roughly 60 tons and was found in Namibia, Wadhwa said. Other larger specimens include a 37-ton piece from Argentina and a 30-ton meteorite that was discovered in Greenland.Zhang and his team also found names scratched into the stone's surface, indicating that some people in the area were likely aware of the unusual rock's existence. The etchings also expose the iron-nickel composition, Zhang said. Further analysis should help determine whether this iron meteorite and the one found in 1898 are related, or if it is merely a coincidence that they were both found in this remote region of China. It is also unknown when or how the massive rock will be removed from its current location to be studied, reported Sky and Telescope.